I have been reading Rob’s blog here for about a year now. One thing I appreciate about Rob is that he really believes that Power Pivot is for the Excel Pro, not just the super geeky IT professional. I have been slowly implementing Power Pivot in my organization for the past six months or so and, based on my experience interacting with non-techy users, I have to agree with Rob that Power Pivot really is for the Excel Pro. Recently I was wondering, why aren’t more companies experiencing this phenomenon? Then it dawned on me, it’s the IT professionals in many cases who are the real barrier to entry for Self-Service BI and Power Pivot. The reason I’m not experiencing resistance from the IT department in my organization is that I happen to be in the IT department. It’s very easy for the IT department to start thinking too highly of themselves or to exercise too much control over their organization’s data. Some IT people see themselves as the guardians to all information in their company. They watch their users like a hawk to make sure they aren’t using non-IT sanctioned products like Dropbox for sharing files or instant messaging for communicating with other employees. This philosophy finds its way into reporting as well. How many times have you heard something like this from an IT person? – I would LIKE to show you how to create this report on your own, but I can’t because it’s REALLY complicated. – We should leave report-writing to the EXPERTS so we can ensure that there aren’t any errors. – We would open this up to everyone, but we just can’t afford to send everyone to the week-long training class that I went to. The truth is: this stuff isn’t as complicated as many people make it out to be. If you don’t believe me, start showing Power Pivot to others in your organization and watch it take off. I think the real problem is that many IT people are scared of losing power. They like to be able to work magic without others really understanding exactly what it is that they do. They don’t want the bright light of Self-Service BI to shine on what they are doing because people might discover that they aren’t as magical as everyone thought. They clutch their reporting tools in their hands like Gollum clutching the ring in Lord of the Rings because they know that information is power. – You hear a lot about the “major” technical challenges that will need to be overcome before you can introduce Power Pivot in your organization. – You sometimes notice a bulge under the shirt of one of the “reporting technicians” that is about the size of a gun and you overhear them talking on the phone in a foreign language (probably contacting the rogue government that employs them). Ok, this is a little excessive, but you get the idea. This might seem like a harsh critique of the IT professional, but remember: I *AM* an IT professional. It takes one to know one. I believe that at least some element of this philosophy has been ingested by every IT professional, myself included. IT departments have power and power corrupts. The irony is that you are actually better off as an IT professional if you share your magic tricks with others because you build connections with people and you gain prestige with others by making their lives easier. I’ve noticed this when doing ERP implementations. During an ERP implementation, there are always those who resist putting their information into the ERP system because they think that they are going to somehow become obsolete. They think that the only way they can remain valuable to the company is to keep what they know in their head, on sticky notes, or in some cryptic filing system that no one else can understand. That way they become the gatekeeper to a world of information, thus ensuring job security for themselves in the future. The reality is that you will actually have more job security if you increase visibility into your area and make it easier for others to access things because you will build connections with others and they will appreciate you for being a team player. The same goes for Self-Service BI. The real value that a person provides to their organization is their ability to communicate and connect with others. The easier they can make things for their customers (internal and external), the more valuable they will be to their company. Communication is key and Power Pivot helps us to communicate with data better than ever before. If you are in an organization with an overbearing IT department, please join me in helping to throw off the yoke of your oppressors and entering the age of Self-service BI. Enter the data democracy revolution by employing Power Pivot in your organization. ERP seems scary to people and very few people want to delve any deeper than to know how to enter data without causing problems and how to get their own reports. I like it when a user wants to delve deeper and tweak reports or create custom views that will make their jobs easier. I like to enable those people. When it comes to BI, I’d like to be an enabler and I think that PowerBI will be a great tool for handing off the tools, a little at a time. So far there are not many Excel power users in my organization, but there are several advanced users who want to expand their skills and I’m happy to offer the training. I’m something of an evangelist in my organization for users, especially Finance Analysts, upskilling in Excel – and while I haven’t always brought colleagues onside as much as I’d have liked to, I recently organized some (Spanish-speaking: Miguel Escobar) PowerPivot training and no less than 40 (!) have signed up. It will be very interesting to see the user uptake % afterwards. And to Tim’s post, IT had absolutely nothing to do with organizing this, much less funding it! At the very beginning (2009), it was basically *only* IT and BI types reading this site. But long ago – several years ago in fact – the “Excel pro” audience passed the IT/BI crowd and is now the overwhelming majority of readership (about 80% at last survey, which was admittedly also a long time ago). So, 80% Excel Pros, 20% IT. That’s the readership here. BUT what % of Excel Pros know about Power Pivot? Probably 1% at best. So when you bump into another Excel Pro, they likely will have no idea what Power Pivot is. IT, by contrast, is much more aware. There are just so many more Excel Pros in the world – that explains the difference. I am also from the finance department. 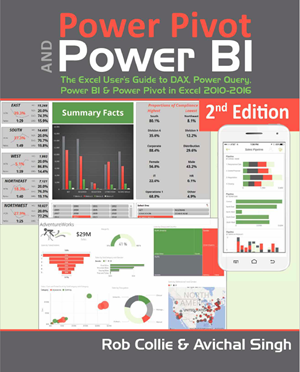 I think the beauty of Power Pivot is that it enables a non-IT people (Excel pro) to have the ability to analyze millions rows of data and easily share the easy-used BI tool with users in sales, marketing, and other departments. I am also trying to implement Power Pivot in my company. My problem is people here don’t appreciate data analysis and managers have been used to making decisions purely based on their experience. I hope my work can change some of their opinions. Sounds as though you have a little bit of an uphill problem there…but I bet you know people who would be open to your approach – and if your data showed another angle…how convincing would that be! Actually this is THE reason it is hard to implement something like Power Pivot. It should be a slam dunk and managers should be praising you for doing it… BUT! Managers don’t like facts. Now that might sound stupid, but one could argue that facts does NOT bring the success people want. If Steve Jobs listened to facts there would be no iphone, and no ipod. If Henry Ford listened to facts there would be no cars. Don’t get me wrong here… Im not saying it is right for managers to prefer “experience” over facts… but they did get hired because of “experience”… if we start to do business based on facts… well that guy is going to get fired. In a way this is the finance peoples thing they are trying to protect. If you don’t have this problem, and its the finance people that want the BI thing… you can be sure that you instead have the above problem of the IT-person wanting to protect its thing, namely all the data. Its just people wanting to uphold the illusions of wizardry. And its a really tiresome mess for us that just want to make tomorrow a bit better. Thanks for this thoughtful post David B! With respect to Medicine, I believe his view is that the docs, can override the algorithm’s but they better have their S*** to together when they do! It seems like managers want facts. But, once they get the facts, they spend all their time trying to disprove them. Maybe it’s because, as you say, the managers are afraid of getting fired if the “facts” replace the need for “experience”. I’m not sure it has to be this way though. There is always more analysis to be done. The model is never complete. There will always be the need to supplement the “facts” with “experience”. But, maybe you’re right, it’s not just the IT professional who wants to keep things shrouded in secrecy. The business manager may have the same motive when it comes to making data-driven decisions. And sooner or later every reader on this page will probably meet someone that matches that description. And remember then that no… its not you, its them. They just get paid a lot for some reason. Hm, this is an interesting angle. I speak as a trainer so I am (to some degree) straddling the two worlds. I see so many people coming in asking for pivot tables (usually with a bead of sweat trickling down their brow) and then they end up saying “is that it?” or “wow, I used to do all those percentages manually” – I pause to wipe a tear from my eye at all their wasted time. I work with finance people and they immediately “get” the value of Powerpivot – more so than other groups I have noticed. Another thread that I see in IT departments are the people who hate Microsoft – they don’t want to learn about Excel and they secretly think Google docs are just as good (it is in the way a bike is as good as a Ferrari – all depends). What I would love is for people to start using Powerpivot and to get so comfortable with it that they start forgetting about the formulas and start playing with the data..I do think though that there needs to be specific customised help for people to implement Powerpivot – to reassure them (especially Finance people) that their figures can be trusted. One of the challenges with encouraging Power Pivot adoption without IT is that in many cases it requires the assistance of an IT department. Installing add-ins, getting 64-bit Excel, upgrading to Excel 2013 (for Power View)…those are all points at which a non-IT person might have to make contact with IT and potentially get shut-down before they even have a chance to prove the power of Power Pivot. One recommendation I make for people facing this situation who work for eligible companies: the Microsoft Home Use Program (microsofthup.com). Get the work version of Excel 2013 on your personal machine for next to nothing and use that to make a case for being allowed to install it at work. You are so right on. Microsoft making Powerpivot enterprise only (or standalone Excel) was such a mistake. Coupled with Powerpivot being tied so much to sharepoint..